The Asian mussel, Musculista senhousia, is a small saltwater mussel. It is a marine bivalve mollusc. It has a relatively fast growth, reaches adult size in about 9 months and can live for about two years. 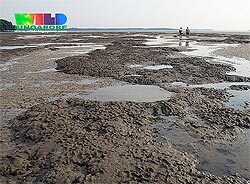 It is found in enclosed intertidal and shallow subtidal flats, occurring to a depth of about eight metres on either soft or hard substrates, even on wooden jetty piles and seaweed. Musculista senhousia is native to the Pacific Ocean, inhabiting coastal areas from Siberia and the Kuril Islands south to Singapore. 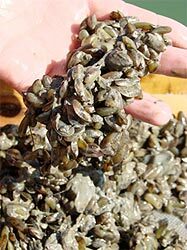 This mussel has been introduced into California, the Mediterranean, New Zealand as well as Australia.. This is unkown for Australia. It is possible that it might have been transported as fouling on the hulls of ships or as larvae in ballast water. The Asian mussel is a successful invader of many parts of the world. In some areas it forms very large mats across shallow sheltered seabeds, with densities reaching 10,000 individuals per square metre. This can alter the local plants and animals and the substrate by competition for food and space. The mussels produce threads that entangle each other to form a mat over the sediment surface. Fine sediment collects in the mats creating a silty layer that can smother filter feeders like cockles and pipi. So far the Asian mussel appears to be having only short-lived minor impacts and so there has been little effort directed towards determining control options. In WA the only predators which have been observed feeding on the mussel are carnivorous gastropods, though predation by some fish species seems likely. In China, the Asian mussel is a source of food. However, its small size seems to indicate that it is unlikely to become popular here.